Department of economics has organised an intercollegiate power point presentation competion on 1st february 2019 in Seminar ronomat 9:00 A.M. onwards. Department Of Economics is organising An Economic Fest " Artharck" an Intercollegiate Power Point Presentation Competition. orientation program for F.Y.B.A. students on 18th of August at 9:30 A.M. in Seminar room (New College). March Past at 6:50 a.m.
Nest is organising photography workshop in collaboration with viva nature club on 22 nd July 2018. Entry is free for viva college students. Viva college cordially invite you with immense pleasure to witness the live demonstration experiments on ‘ Basic principles of Physics’ organize with association of Tata Institute of Fundamental Research (TIFR) on Tuesday 27 th February 2018 at terrace (old college). Dept of BMM is proud to present its annual departmental event Xpression 2018. This year's theme is Enriching Life. It is an intra-collegiate competitive event presenting TVC, Radio Jingles and Print Ads. आपणांस कळविण्यात येते की मराठीतील ख्यातनाम कवी,लेखक व समीक्षक “विंदा करंदीकर” यांच्या जन्मशताब्दी वर्षानिमित्त महाविद्यालयाच्या ग्रंथालयातर्फे दिनांक २५ जानेवारी २०१८ रोजी काव्यवाचन स्पर्धा आयोजित करण्यात आली आहे. तरी आपण सर्वांनी या कार्यक्रमास उपस्थित राहून स्पर्धकांना प्रोस्ताहित करावे व कार्यक्रमाचा आस्वाद घ्यावा. Hindi Sahitya Sabha organised a Poster Making competition to celebrate the spirit of Republic Day and to promote skills of students. Intercollegiate Quiz Competition and Movie Screening on the "Life and Teachings of Mahatma Gandhi"
Topics for JAM Competition  GST AND COMMON MAN.  AGRICULTURAL LOAN AND RELIEF SCHEMES.  INDIAN MARKET A DUMPING GROUND FOR CHINA. 11:00 AM Seminar Hall,Old Campus. BMM Dept invite all the teaching , non-teaching and students for the event. Your presence will be highly appreciated. The Times of India, Maharashra Times and Federal Bank are organizing biggest Intercollegiate event ‘Speak for India’ across the nation. This is Intercollegiate Debate Competition for students. THE DEPARTMENT OF HISTORY IS ORGANISING A ONE DAY WORKSHOP ON "INDIAN NUMISMATICS" BY DR. MAHESH KALRA ON 23/08/2016, AT 10.30 AM SEMINAR ROOM,NEW VIVA COLLEGE CAMPUS. Workshop on Revised Syllabus for M.com (Part I). Invitation for one day Workshop on Revised Syllabus for M.com (Part I). Workshop is organized for S.Y.J.C. Science students. A Seminar on SEWA by Mrs. Kundatai Pathak is organised by Women Development Cell of VIVA college on 17th December 2015 in Seminar Hall A-Wing 1st floor New Campus at 10 am. You are invited for alumni meet for 2015-16. Here students are very creative and think out of the box.The Professors have always offered help not only in terms of studies but also for other college activities. 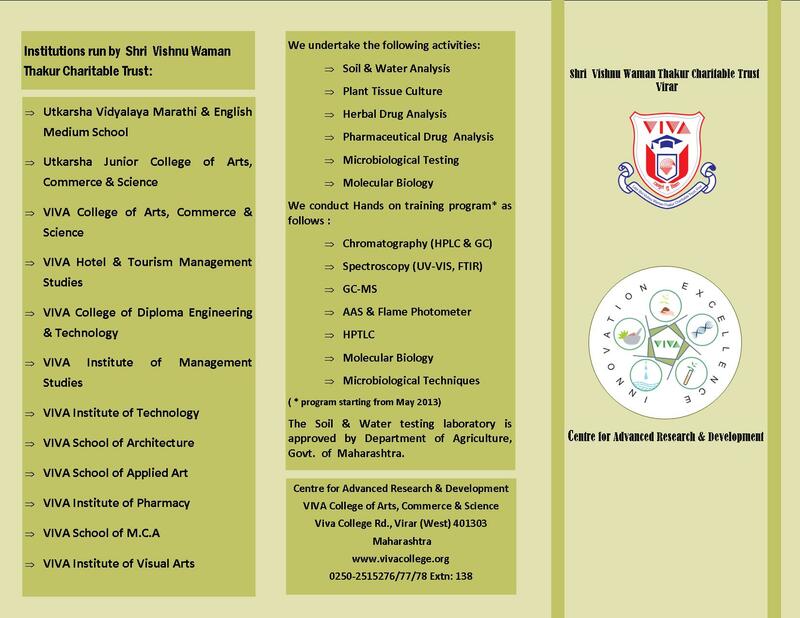 A big thank to Viva College. Since one year my journey as a student at Viva College is quite delightful as all of my teachers were great and helpful. I got exactly what I wanted out of this course.I am very thankful to Our VIVA Trust's President Shri. Hitendra Thakur for providing us with such a huge and awesome educational campus.